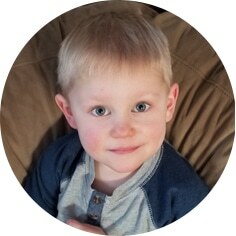 Our hearts are broken to announce, Tyson Robert Sweers passed away suddenly at his home in the RM of Caron, SK on Saturday, February 2nd, 2019 at the age of 3 years. Tyson will be lovingly missed by his parents, Jordon and Leeann Sweers; and his brothers, Cohen and Tanner. He will be remembered by grandparents, Diane Sweers, and Robert and Brenda Labrie; as well as many aunts, uncles, cousins and friends. He was met in Heaven by his grandfather, Clinton Sweers and many great-grandparents. Tyson, you were given to us for what seemed like a blink of an eye. From the moment you were born we knew you were special. There was a spark inside you – a light. You were so fierce, wild and full of energy, yet so gentle and kind. You had the most beautiful smile with a glimpse of mischief and the most amazing blue eyes. You almost looked angelic. Tyson loved all things boy. He loved playing in the mud and sandbox, his trucks, trains and going on adventures. You were not afraid of anything and lived every moment of your life full on. His brothers were his best buds, his daddy was his hero, and his mommy was his home. May his light continue to shine bright within all of us. A Celebration of Life will be held on Saturday, February 9th, 2019 at 11:00 a.m. in the Harvey Room at Moose Jaw Funeral Home. All are welcome to come and share in Tyson’s celebration. In lieu of flowers, donations in Tyson’s name may be made to the Rowletta Civic Centre by e-transfer to rowlettacivic@gmail.com. Our deepest sympathy to the entire Sweers family. May all your wonderful memories help you through this very difficult time. I’m so sorry Leeann & Jordan. My heart hurts for you both & your families. I can’t imagine you’re pain but am sending love your way. Our thoughts are with you all at this sad time. May you find strength in knowing that many people like us who are not a part of your life anymore still care. Life is so precious. Our sincerest sympathies to the Sweers and Labrie families. May you find comfort in the fond memories you have of your little guy. Diane, my heart breaks for you and your family. I can’t imagine loosing a grandchild so young. Im sending you lots of love a big hugs. Leanne and Jordan we are truly sorry for your loss. The loss of a child is heartbreaking. Our heart aches for you and your family. You are in our thoughts. I pray you find strength in This difficult time and comfort in your memories. So many people are mourning for you Leeann, Jordan and your beautiful boys. We are sending our heartfelt sympathies to Jordan, Leeann, Cohen and Tanner and Diane, Robert, Brenda and family members. Words cannot express our sorrow. Please know all of us are thinking of you. It breaks my heart to see young ones like sweet little Tyson separated from those who loved him. I know, there is no words that can alleviate the pain of losing a dear sweet baby. Death it’s like a stab in the heart. Yet, I want to share with you something that soothed my pain, and that is, Hope, having the hope of seeing my brother again and many others like little Tyson reunited with their families has helped to cope with my loss and endure difficult days. The Bible has given me hope and comfort. I wanted to share that with you too. 1 Corinthians 15: 26 says: “And the last enemy, death, is to be brought to nothing”. Death is an enemy since it separate us from our loved ones. God has the purpose of reuniting us with our loved ones through a resurrection, and eliminate death forever. What a wonderful day that will be, to see all those sleeping in death will come back to be with their families. My wife and I as JW would like to express our sympathy to the family in losing such a young boy to our enemy death. Yes death has no sympathy to ones age as mention in the Bible at Romans 5:12. Our hearts break for the parents of young Tyson and his siblings. No parent should ever have to bury a child. His brief time on earth will have brought you immeasurable joy. That was his gift. Leanne, Jordan, Cohen and Tanner we are so sorry for your loss! May the special memories of Tyson help you through the days ahead! Leanne, Jordan & family our thoughts and prayers are with you all! Our deepest sympathies on the loss of your son. Our thoughts and prayers are with you. Leeann and Jordan sending prayers for you in this difficult time . may you remember the wonderful times you had and hold them close to your heart. much love & strength ❤️ You’re in our prayers. We are so, so sorry to hear of the loss of your dear son Tyson, truly heartbreaking for your family. Our thoughts are with you, sending our sincere heartfelt condolences to all. Your love for your children and each other is undying. Find strength in your family, your friends, your community. Our prayers are with you every day that you find peace. Tyson will shine through in every little thing you see and do. You will see him in that snowflake, that flower, that leaf. You will hear him in a gentle wind, a rain shower. You will feel him in a ray of sun. He is everywhere you are. Let this carry you. Let the wonderful memories of life with Tyson be your rock. My heart hurts, so much for your family. I can’t imagine, how broken your family is after, your loss of sweet little Tyson. Wrap your arms around, each other and your boys. Hold on tight, and may the memories of him, make you even closer as a family. So, one day soon you might feel like you can breathe again. My thoughts and prayers are with you all. I do not know your family but I do feel very sad for your loss.Deepest sy,pathy.